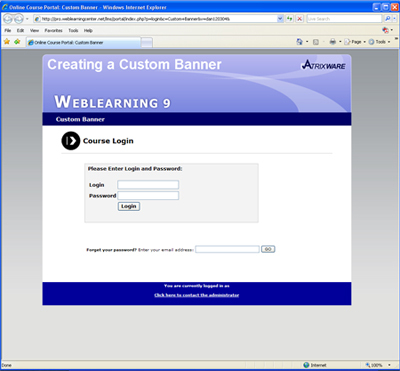 In the Atrixware Weblearning 9.0 system, you can upload your own corporate/company logos to use along the top of your courses, and even on your quizzes and presentations. Let me show you how easy it is. I will begin by uploading a custom header for a course. 1. Click the Files tab, click Browse, navigate to your image file and click upload. (You can confirm that it uploaded by selecting the existing uploads tab and clicking the appropriate file type tab). 3. Navigate to the Banner drop down menu, select your banner image and click save changes. If your image is not in the drop down, check the exisiting uploads area under the Files tab to confirm it was uploaded. To upload a header to a quiz that you have created, follow the steps below. 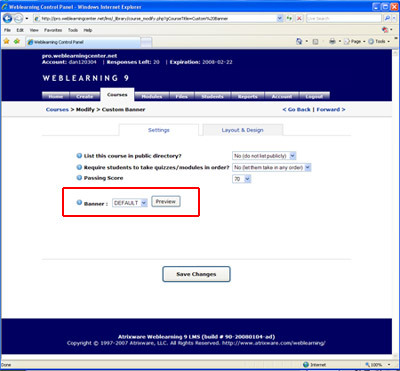 This entry was posted on Friday, February 15th, 2008 at 2:02 pm	and is filed under Atrixware 101, Dan, Weblearning. Both comments and pings are currently closed.